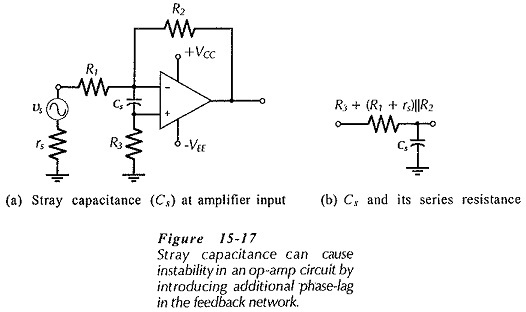 Stray Capacitance Effects (Cs) at the input terminals of an operational amplifier effectively introduces an additional phase-lag network in the feedback loop, (see Fig. 15-17), thus making the op-amp circuit unstable. Stray capacitance problems can be avoided by good circuit construction techniques that keep the stray to a minimum. 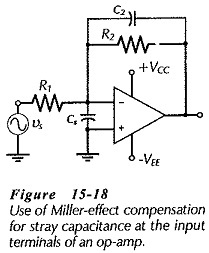 The effects of stray capacitance also depend upon the resistor values used in the feedback network. High resistance values make it easier for small stray capacitances to produce phase lag. With low-resistances, small stray capacitances normally have little effect on the circuit stability. where R is the equivalent resistance in series with the stray capacitance. In Fig. 15-17, R = R3 + (R1 + rs)||R2. From Eq. 15-4 it is seen that (as already mentioned) the larger resistor values the smaller the stray capacitance that can produce circuit instability. If the signal source is disconnected from the circuit, R becomes equal to (R2 + R3), which is much larger than [R3 + (rs + R1)||R2]. In this situation, extremely small stray capacitance values can make the circuit unstable. Note that Eq. 15-5 does not allow for rs or R3 in Fig. 15-17. Where rs is not very much smaller than R1, it must be added to R1. Also, resistor R3 could be bypassed with another capacitor to reduce the total series resistance.